With Sandals Resorts International’s new Aisle to Isle destination wedding experience, clients can make sure their big day is one of a kind. From the shabby chic designs of Caribbean Breezes to the classic white look of White Romance with flower-topped candelabras, Sandals has launched eight new destination wedding decor inspirations along with the tagline “Inspired by love. Created by you. Only at Sandals.” Clients can mix and match their favourite elements from any of the options to create their own customized look and design. As for food and drinks, there are 35 new menu options and a wide array of bar styles to choose from, including a geometric bar, an ivy bar, a bar built of rum barrels and even a canoe bar — like the name suggests, a canoe fully loaded with ice-cold drinks. 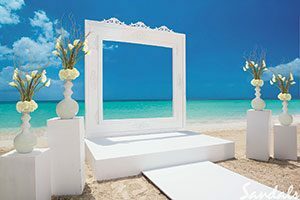 In addition to expanded photography and videography options for more unique settings like a photoshoot at a sugarcane plantation, the latest wedding venue options include the over-the-water chapels Sandals South Coast in Jamaica, as well as Sandals Grande St. Lucia and the newly renovated chapel at Sandals Montego Bay. 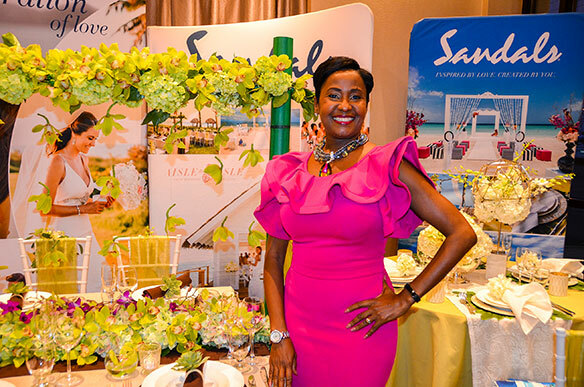 Whether it’s the beach, garden or a gazebo, Brown says Sandals is adding a venue scheduler to prioritize clients’ preferred location for the wedding. From wedding upgrades to Sandals’ Test-Drive Your Wedding, which allows clients to get a preview of their wedding ahead of time, she says everything is commissionable to agents. Inspired by romance, White Romance features an elegant white and silver palette from pearly satin slipcovers and tabletop candelabras to white roses and hydrangeas, for couples looking for a white wedding. Inspired by the islands, Island Chic boasts a mixture of natural elements with a tropical twist such as hanging flower stands from bamboo-style over-head bridges, floral table runners, or the illusion of a floating floral curtain for the ceremony backdrop. Inspired by the tropics, When In The Tropics has an island vibe across wicker lanterns, arches made from palm fronds, and colourful tabletop votives and floral. Inspired by sophistication, Signature Statement is another elegant affair with towering arrangements of white calla lilies and blossoms, tassel accents and touches like woven chiffon chair backs and a flower- adorned aisle for the ceremony. Inspired by gardens, Love Is In Bloom is all about natural botanical beauty from a standing flower wall or hanging floral spheres to flowing seat shears in white or chartreuse. Inspired by passion, Modern Love has contemporary flair across black and white patterns infused with elements of fuchsia. Inspired by nature, Caribbean Breezes is shabby chic meets romance with rustic elements like driftwood spheres, earth-toned linens and wooden accents. When describing Coastal Living, which is inspired by sand and sea, think of a wedding that is 50 shades of blue. Options include nautical embellishments like starfish and seashell detailing or an aisle made of oars. With Sandals’ Bells and Whistles perks, the larger the wedding party, the more bonuses couples receive. For example, with a booking of 5-11 rooms, newlyweds-to-be get two Bells, while bookings for 12-19 rooms receives two Bells and two Whistles. 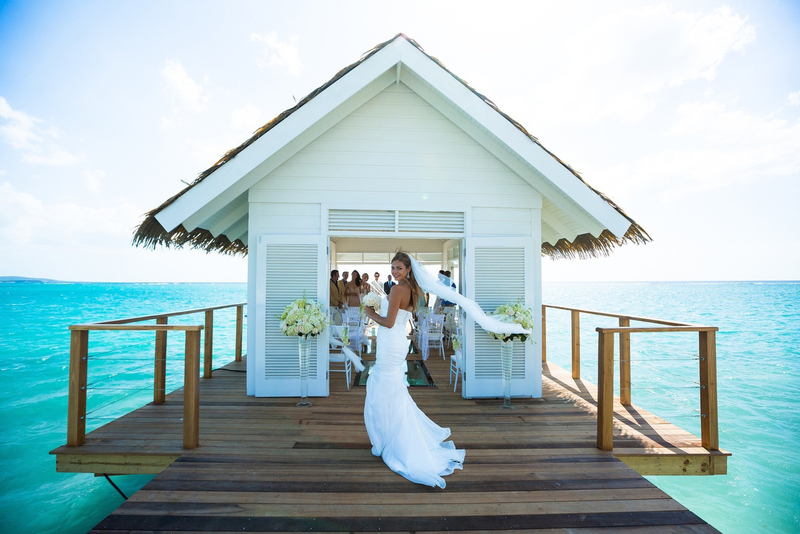 As the typical destination wedding with the company is averaging 40 guests — and a recent celebration was upwards of 120 — Marsha-Ann Brown, director of romance for Sandals and Beaches Resorts says couples have a lot of perks to choose from. “What they get a chance to do is choose from a myriad of options, whether it is that they want to enjoy a one category upgrade, do they want to enjoy a complimentary spa-themed bridal party? Do they want to have a women’s game night? These are things that we’re including, as a part of the option with the number of rooms that are sold,” she says. So what is a bell bonus?